How can we address the high prices of medicines that are straining health budgets? How can openly sharing green knowledge help an agreement at the climate change talks in Paris this year? How could TTIP further privatize knowledge and what can we do about it? What does it mean to say the Internet belongs to everyone? The Commons perspective sheds light on the democratic governance of knowledge for the common good and identifies knowledge as a shared resource that is a collective responsibility. It emphasizes equitable access to knowledge resources such as health-care, the need to prioritize ecological sustainability in knowledge policy and to promote participation in the management of an open and democratic Internet. In the paper A Commons Approach to EU Knowledge Policy, Sophie Bloemen & David Hammerstein explain the commons perspective and apply it to various domains of policy that need urgent attention in Europe today. 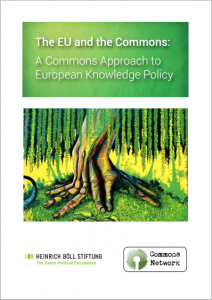 A Commons Approach to European Knowledge Policy is a publication by Commons Network and the Heinrich Böll Foundation.